Celebrating family birthdays with a special dinner and gifts is a common tradition in North America. But, as children grow up and start their own families, finding useful and appropriate gifts for their adult siblings and parents becomes more and more difficult, as does finding the time for special celebrations for each person’s birthday, especially for larger families. At what point can you stop giving gifts to adult siblings or, as an adult child, to your parents without creating any hard feelings? Often, siblings and children who move away stop sending gifts when the cost of shipping becomes too much. But, for families who continue to live close together and see each other often, the transition away from gift giving can be awkward. For most people, failing to offer a gift to a sibling and then receiving one from them on your birthday is not a nice feeling, nor is spending hours searching for a gift that will be appreciated but is still within your budget. Before making a decision, discuss the issue as a family. If everyone is content to simply receive a birthday wish and perhaps a card on their special day, then make that the rule and stick to it. However, if everyone would still like to do something to acknowledge birthdays, consider developing a communal birthday celebration. What is a Communal Birthday? A communal birthday is a celebration of all members’ birthdays on a single day. To set up a communal birthday, select a day to have the celebration. Unlike an actual birthday, the communal birthday doesn’t have to be the same day each year. You can adjust the date every year so the celebration is most convenient, for example, you could plan to celebrate the first weekend in June each year. A summer communal birthday works well because it is halfway to Christmas and opens up celebration possibilities to outdoor events like picnics and barbeques. Choose an event that is easy for everyone, such as a potluck dinner where everyone contributes food and helps to clean up afterwards. You could also assign a different person to bring the cake each year. 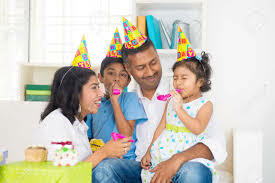 Note: Children are not likely to appreciate communal birthdays and should still have their individual celebration, but your family can decide at what age the children will be initiated into the communal birthday event and stop receiving individual celebrations and gifts. Have a gift exchange where names are randomly and anonymously assigned to each person who is participating in the communal birthday. Set a price limit. At the event, everyone brings a gift that is within the price limit for the person they were assigned. If the presents are delivered unsigned, part of the gift opening can include guessing who brought the gift. Have a gift exchange where everyone brings a generic gift that can be given to any participant. Set a price limit. At the gift opening, draw names to determine the order that people open a gift. The first person selects a gift to open. The second person can choose to “steal” the gift from the first person, who then picks another gift, or to select one from the gift pile. This continues until the final gift is opened. Then, the first person to open a gift has the last option to “steal” a gift from someone else. Have all participants contribute the amount of money they would have spent on a gift to a fund. Then have each person pick a charity they want to support. Donate an equal portion of the gift money to the selected charities in the person’s name. Agree on a charity as a family and donate the entire gift amount as a lump sum on behalf of the entire family. Birthdays are a special time for individuals, but in a family, they can also be a way to reconnect and celebrate each other with quality family time, especially as adults. Removing the pressure of having to find the perfect, affordable gift for each family member, can help people relax and simply enjoy each other’s company. Of course, on each family member’s actual birth date, you should still acknowledge him or her with a phone call, card, or email greeting.